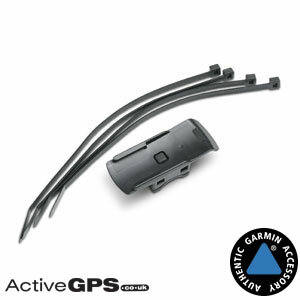 Using this versatile mount you can attach and fix your compatible Garmin handheld device exactly where you need it, e.g. bike handlebar or golf trolley. The mount attaches securely to spine/tubular bars of up to 1-inch using the four supplied ties, and can be mounted horizontally or vertically. Compatibility: Compatible with Garmin Alpha, Approach G3, G5, Astro, Atemos series, Colorado series, Dakota series, eTrex 10, 20, 20x, 30, 30x, eTrex Touch 25/35, GPSMAP 62, 64 and 66 series, inReach series, Oregon series and Rino 610, 650 and 655t. To view a full list of compatible products click here. IMPORTANT: This handlebar mount is not compatible with Garmin eTrex Legend, eTrex Vista and eTrex Summit models and nor is it compatible with the GPSMAP 60, 60Cs, 60CSx etc. Want to use and mount your compatible Garmin handheld device on your mountain or road bike? Maybe you want to mount your Garmin Approach Golf GPS unit to handlebar of your golf trolley or buggy? You need to buy this genuine Garmin accessory that will enable you to do exactly that. The handlebar mount attaches securely to tubular bars of up to 1-inch using the four supplied ties, and can be mounted both horizontally or vertically. The bike/cart mount is compatible with a variety of Garmin devices including the Garmin Oregon range, GPSMAP 62 and 64 series, Dakota series and Approach range. For full compatibility list click here. Please note: This handlebar mount is not compatible with Garmin eTrex Legend, Vista and Summit models and nor is it compatible with the GPSMAP 60 series. To view the full compatibility list click here or scroll down to "What is the handlebar mount compatible with?". What is the handlebar mount compatible with? Garmin Alpha, Approach G3, G5, Astro, Atemos 100/K 5 System, Atemos 50 and K 5, Colorado 300, 400c 400i, 400t, Dakota 10, 20, eTrex 10, 20, 20x, 30, 30x, Touch 25, Touch 35, GPSMAP 62, 62s, 62sc, 62st, 62stc, 64, 64s, 64sc, 64st, 66s, 66st, inReach Explorer+, SE+, Oregon 200, 300, 400t, 450, 450t, 550, 550t, 600, 600t, 650, 650t, 700, 750, 750t, Rino 610, 650, 655t. Please note: This handlebar mount is NOT compatible with the Garmin eTrex Legend, eTrex Vista and eTrex Summit models and nor is it compatible with the GPSMAP 60, GPSMAP 60C, GPSMAP 60Cx and GPSMAP 60CSx.